Fulham manager Martin Jol admits two back-to-back London derbies could determine his future at the club. The Cottagers are in the Premier League's bottom three after five consecutive defeats and play fellow strugglers West Ham on Saturday before facing Tottenham on Wednesday. Asked if his position was safe, Jol said: "If we win, yeah. If we don't, I don't know. It's always difficult. "If I was on the board or an owner I would be worrying. We need wins." 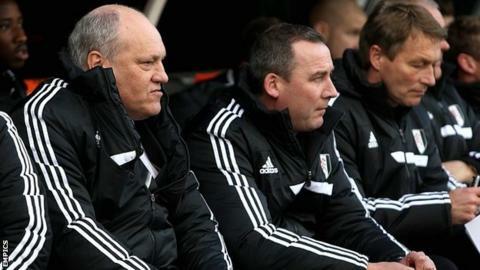 Fulham have earned 10 points from 12 matches this season and have won just once at Craven Cottage, leading some fans to criticise Jol and his players. New owner Shahid Khan said there would be no "rash" decisions at the start of November before Fulham lost to Manchester United,Liverpool and Swansea. Jol, who joined the club in June 2011, added: "You don't have to talk to an owner to be aware of the fact that you need points to get back to a winning culture, to a little bit of stability. West Ham are one place above Fulham in the table, with goal difference separating the two sides, and Jol said he wanted to promote a sense of unity to get the fans back on side. "It's not about me, it is about us," ex-Tottenham manager Jol, 57, said. "It's a big week because if we could manage to win two games we would be fine. "My message is you have to back the players. If you talk about [strikers] Dimitar Berbatov or Bryan Ruiz, they are different they are skilful players, but they are giving 100%, believe me, even though they look a bit different. Earlier this month, the club appointed former Manchester United coach Rene Meulensteen as head coach to work alongside Jol. And the Fulham boss said of his fellow Dutchman: "Sometimes you have to change something to get back to winning ways and I thought it was necessary to get someone like him and I think it has paid off in training. "The players have responded to it and some have got a new lease of life.